Frank Weaver was born in 1880 to Elijah Weaver, a general labourer, and Eliza née Barnes and baptised in his parish church of St Andrew's, Whitminster on 19 September the same year. In 1901 both Frank and his father were working on the roads. On 14 April 1909 Frank married Elizabeth Caroline Mary, sister of Victor Charles Lawrence, at St Mary's, Fretherne, by which time Frank had become a gardener. Their first son, Charles Elijah, was born the next year, and Francis followed in 1914. 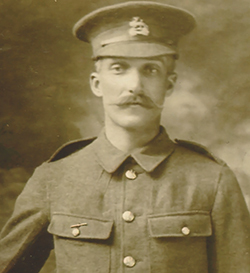 On 24 November 1915 Frank volunteered to join the Army, and was posted as a private to the 11th (Labour) Battalion of the Royal Berkshire Regiment, which served in France from July 1916; their role would have been to dig trenches, build fortifications, and build and maintain roads and light railways. At some stage he was transferred to the Devonshire Regiment. According to family members, Frank suffered from shell shock, and spent time in the sanatorium at Cranham from where he wrote a postcard home to his son, Charlie. On 7 June 1917 Frank was discharged from the Army as no longer fit for military service and awarded the Silver War Badge. He later received the British War Medal and Victory Medal and is commemorated on the plaque in the village hall. Home for the Weaver family was at The Lake, in Frampton, and two more sons were born, Leslie and Hubert. Frank Weaver died at the age of 44 and was buried at St Mary's on 25 June 1924. His widow later married another war veteran, her widowed brother-in-law, Victor William Wilks.